From early centuries woman kept fire in the house and raised children while man was searching for food. Today these notions have undergone huge transformations. 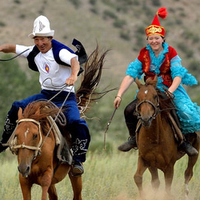 In Europe for example the rights are equal from long ago, but in such country as Kyrgyzstan this kind of tradition is still alive. Men work and earn money and women stay home and raise kids, cook, clean, do laundry and usual house work. But don’t think that their life is boring as they have time to see how their kids are growing from day to day, they bring calmness and warmth into the life of the whole family and they have time for their hobby when they sit and do crocheting, embroidering, spinning, making woolen toys, slippers, carpets, coasters and other useful things for their home. 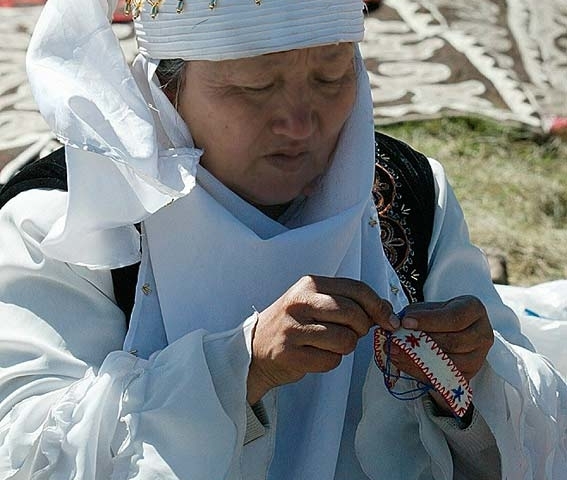 In this tour we would like to present you the life of usual Kyrgyz women and their crafts. You will be able to go to local bazaars, cook national dishes, make woolen things, learn how to spin and many other things. 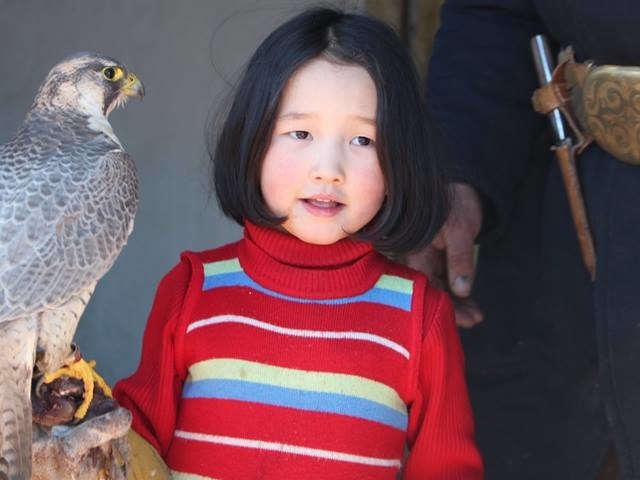 Join us and you will feel what it is to be a woman in Kyrgyzstan! Arrival to Bishkek, meeting at the “Manas” airport, Transfer to “Asia Mountains” hotel. Rest. 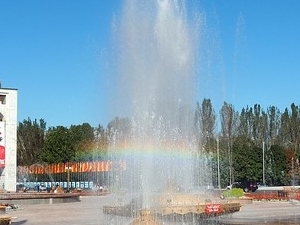 Bishkek is the capital of Kyrgyzstan and the biggest city in the country. It has many places to see. There are some large museums; the center of the town is dappled by the show bills of Opera and Ballet Theater, Russian and Kyrgyz theaters, Bishkek Theater of Drama and National Philharmonic. There are many places reminding people of the Soviet Union period of time. The influence of that epoch is mostly felt in the center where you may still see the row of soviet architecture buildings: Philharmonic, Government building, Historical museum, Victory monument. But you will also be able to see the modern samples of Kyrgyz architecture: Manas monument, monument of Courage, the monuments of akyns (Kyrgyz poets), manaschi (Kyrgyz Manas legend tellers) and local rulers of different times. The interesting fact is that Bishkek is the only town in Central Asia that still has the monument of V. I. Lenin on the central square. Bishkek remembers its history and will definitely tell it to everybody who wants to visit this small but cozy capital. The town is also known to be one of the most ecological towns of the world due to a lot of green parks keeping the shadow and coolness even on the hottest summer day. Today we will go with you on a city tour. We will walk through the center of the town, go to the central mall in which you may find one floor filled with craft products. 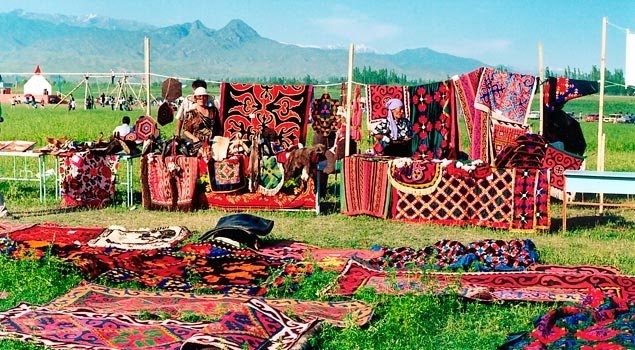 We will also visit Osh bazaar where you will dive into the busy local life with people selling and buying, try local round bread “lepyoshka” and buy some fresh fruits. Dinner and overnight in the hotel. In the morning after breakfast we will drive to the town of Tokmok. On the way we will visit the Historical and Archaeological Complex - Burana Tower. The Burana Tower (minaret) is located on the site of the ancient city, 90 km from the capital - Bishkek. Historians and archaeologists have proved that the settlement was the capital of the Karakhanid Khanate and was called Balasagun. Balasagun was founded in the mid of 10th century and the Burana Tower is now the central monument of the complex. After the tour we will stop at the home of local residents. After lunch with the older woman you will go to the local bazaar to buy vegetables, spices and other things for the national dish you will be cooking this evening. Coming home you will learn how to cook such national dish as “manty”and some easy salads. Today after breakfast we will say goodbye to our first Kyrgyz family and continue our way to the village of Tamchy located on the shores of one of the most beautiful lakes in Kyrgyzstan – Issyk-Kul lake. 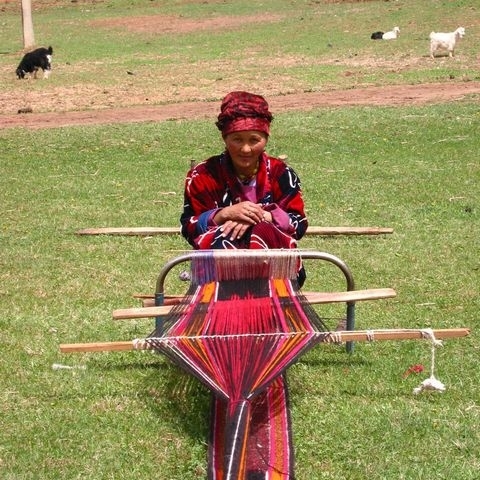 We will be welcomed by a local family where we will learn how to make woolen coasters. The hostess will show us how to dye wool and stick elements together. 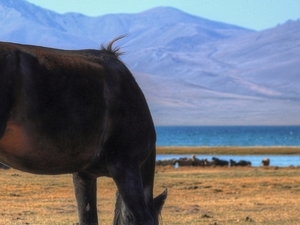 Our evening will be free and we will have a chance to go to the shores of Issyk-Kul. Dinner at the home of local residents and overnight. This day will be devoted to spinning and making national woolen carpets. 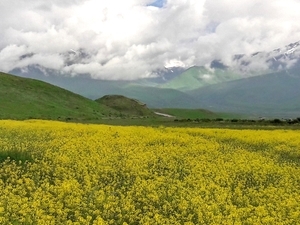 After all that we will drive to the place of our night stay – Karakol town. Accommodation in the hotel, rest. In the morning we will visit with you "Holy Trinity Cathedral" and the Dungan mosque in Karakol, and then go to Djety-Oguz gorge. 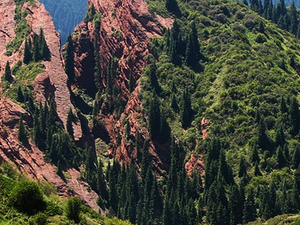 The gorge is located 60 km to the west of Karakol on the northern slopes of Terskey-Ala-Too. 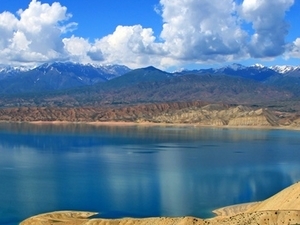 This is one of the most beautiful places in Kyrgyzstan. For 25 km on both sides of the gorge the fir trees are growing at first merging into small groups and then turning into huge forest mass. The gorge finally becomes a wide Kok-Djayik valley which is totally covered by fir forests up to the very top of the ridge. Over the forest zone (about 3000 m) in the wide valley of about 15 km there are amazing subalpine and alpine meadows called Djailoo. 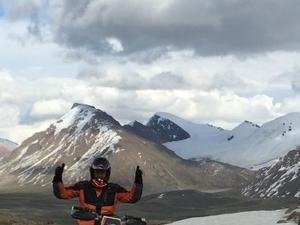 After that we will continue our way and drive to Kyzyl-Tuu village. 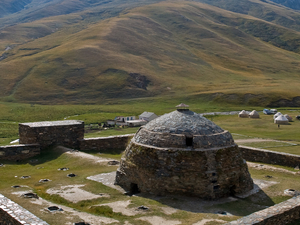 This village is known for being the place where people make yurts – Kyrgyz national round houses built without a single nail. 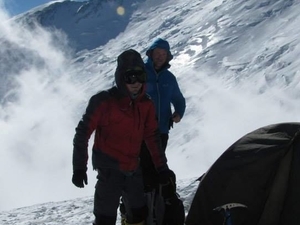 And the truth is - where to find in the vast snow-capped mountains, at least one small piece of metal? People have to earn money and in this village it’s based on yurt production. All families are different and they all make different things for yurt. Some make wooden constructions, some make yurt decorations, yurt cover and many other things that have to be in the Kyrgyz style home. Here we will visit the local crafts museum and learn how to do the embroidery. This day you'll learn the secrets of the national cuisine, discover new tastes and learn to prepare delicious Asian sweets. 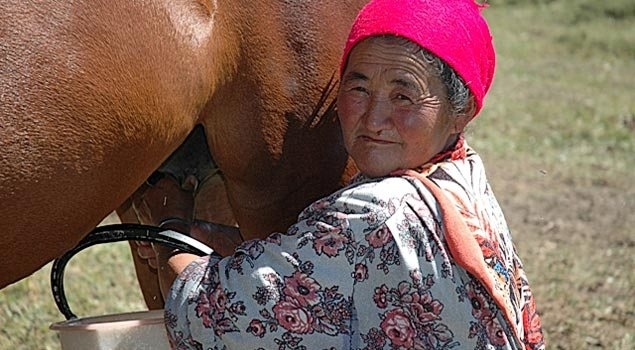 Arriving home, you can easily show off your ability to not only properly prepare dishes of the Kyrgyz people, but also to apply them correctly. We will visit with you shop for the manufacture of felt products where you may buy craft things for your relatives and friends. Lunch and dinner at the home of local residents, the evening of relaxation and sweet sleep. 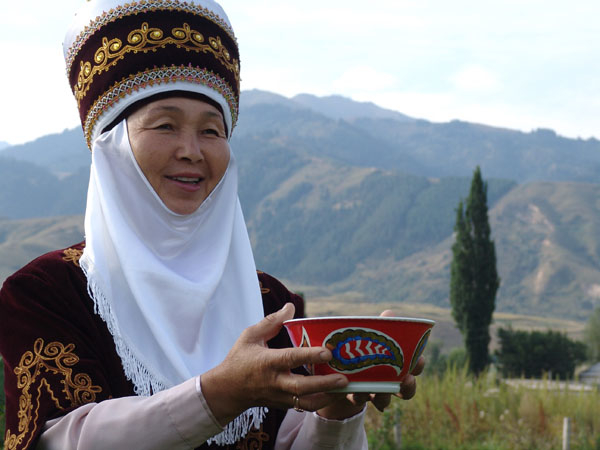 According to the traditions of Kirghiz people in the morning we will visit the neighbors and friends. We will gather at the table, drink tea with mountain herbs, cookies and candies. After lunch we will go back to Bishkek. In the evening we will go to the central square, where a large number of people will gather to enjoy the coolness of summer evening. The city will open its arms to you and will let you see it in all its glory. Today in the morning the car will get you to the airport for your flight home.